“The British political class has offered to the world an astounding spectacle of mendacious, intellectually limited hustlers.” This is a direct quote from last week’s New York Times, a newspaper that is known for being anti–heterosexual white male, anti-Christian, and now anti–British ruling class. Mind you, normally when someone attacks the British I smile, and more often than not I mumble that no one hits the Brits harder than themselves. This time, however, let’s take a second look as to why the venom. Under the heading “The Malign Incompetence of the British Ruling Class,” some clown I’ve never heard of takes up half a broadsheet page denouncing Britain’s past in general and the ruling class in particular. (The poor jerk mixes up past and present ruling classes, but never mind.) Why now? Search me, but a little bird tells me that Brexit has something to do with it. The real rulers of today, Davos types and members of the international deep state, or IDS, are never mentioned. The article seems to have been written by someone who might have been insulted by some upper-class twit long ago and has never gotten over the insult. My, my, how many shrinks did this poor soul consult to come to such conclusions as: “English Brexiteers are chasing imperial virility”? When I called my friend Robin Birley and asked him why he was chasing imperial virility (Robs is the quintessential English gent and very patriotic), he let out his unique loud ululation and asked me what moron had come up with that one. And it gets better. The reason people voted the way they did back in 2016 can be traced, and the Times writer quotes E.M. Forster, to “privately educated men, callow beneficiaries of the country’s elitist public school system.” Now he tells us. Boo, down with Eton, and here I was thinking that it was working-class people in the north of England who voted to get out, but now I realize it was an upper-class plot, elitist public school buggers. Taking into account that leading Brexiteers like Boris Johnson, Michael Gove, Daniel Hannan, and Jacob Rees-Mogg are the four richest-in-cash-and-land people in Britain—the four alone control 90 percent of all British land and 70 percent of the cash available—I understand the frustration of the Times man scribbling away in some dump in the Bronx. But fair’s fair. 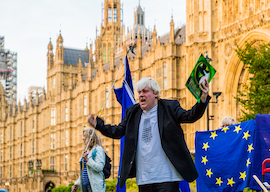 Here’s the Bronx recorder yet again: “Britain’s rupture with the European Union is proving to be another act of moral dereliction by the country’s rulers. The Brexiteers, pursuing a fantasy of imperial-era strength…have repeatedly revealed their hubris, mulishness and ineptitude….” Gunga Din, where in blazes is my pith helmet? The flatulence goes on, exposing the elite’s “arrogant obduracy” and explaining to us how “egotistic and destructive behavior by the British elite flabbergasts many people today.” I don’t know about you, but I’m sure as hell flabbergasted, and so is my manservant Gunga Din. (Poor man, he insists on wearing only his loincloth and almost froze last week.) But let’s get serious. The Bronx Balzac blames the Brit elite for untold suffering, and he could be right. They even blackballed Robert Mugabe at White’s, and poor Bobby cried. Zimbabwe, once the breadbasket of Africa along with Sudan, now has people starving in the streets, but this clown blames the Brits for it. I say maybe he—the Bronx scribbler—drinks too much firewater. The best thing that could happen to Zimbabwe and Sudan is to be recolonized by the Brits. But no such luck for those poor bastards. The Times piece concludes with more historical ironies waylaying Britain on its way out of Europe, and that “it is safe to say that a long-cosseted British ruling class has finally come to the end….” (Corbyn will surely nationalize Boris’ 4 million acres, not to mention Jacob’s 101 nannies.) But seriously, The New York Times has a long history of anti-Christian coverage—“exposechristianschools” was a Times reporter soliciting anti-Christian comments—and although this has little to do with Brexit and so-called Brit elites, it illustrates to what extent the paper will go in order to draw a new hip readership, an anti-Brit-elite, anti-Christian, anti-heterosexual, anti-white, anti-everything-normal crowd. Mind you, Bezos’ baby, The Washington Post, has one up on the Times. Some of its top editors recently were heard saying how incredulous they were that Christian schools can “still happen” in contemporary America. Oh well, some Brits do get good coverage by the Times—John Berkowitz, for example, better known as John Bercow or Speaker of the House. Here’s a man who holds a position of plenipotential dignity but has managed to turn it into a music-hall Archie Rice role, using his thesaurus the way Rommel used his Panzers, but the Times likes him. And why not? The paper does not have to buy a used car from him, but would any of you readers trust him if he were selling one? I’d buy one from his father, who used to sell used cars in North London, but never one from the thesaurus tiger. The driver’s seat would be stuck much too close to the pedals. I’m not tall, but nor am I a dwarf, nor a poisoned one at that.